Heat oven to 450°F. Place 1 pie crust in ungreased 9-inch glass pie plate. Press crust firmly against side and bottom. Cut star shapes or other desired shapes from second pie crust. Attach to the edge of pie crust in pie plate with beaten egg; brush tops of shapes with beaten egg. Prick bottom and side with fork. Bake 10 to 12 minutes or until light brown. Cool. Reduce oven temperature to 350°F. Arrange bacon slices on ungreased 15x10x1-inch pan. Bake about 15 minutes or until bacon is crisp and brown. Drain on paper towels. Crumble into small bite-size pieces. Reserve half of the bacon pieces for garnish. Meanwhile, in 2-quart saucepan, heat evaporated milk, chocolate chips and 1/2 cup sugar to boiling over medium heat, stirring constantly. Remove from heat, and stir in butter and vanilla; set aside. In large bowl, beat cream cheese, peanut butter and 1/2 cup sugar with electric mixer on medium speed until smooth. Gently stir in whipped topping until combined. Spread 1/2 cup chocolate sauce over cooled crust. Sprinkle half of the bacon pieces over chocolate sauce. Slice banana and arrange over bacon pieces. 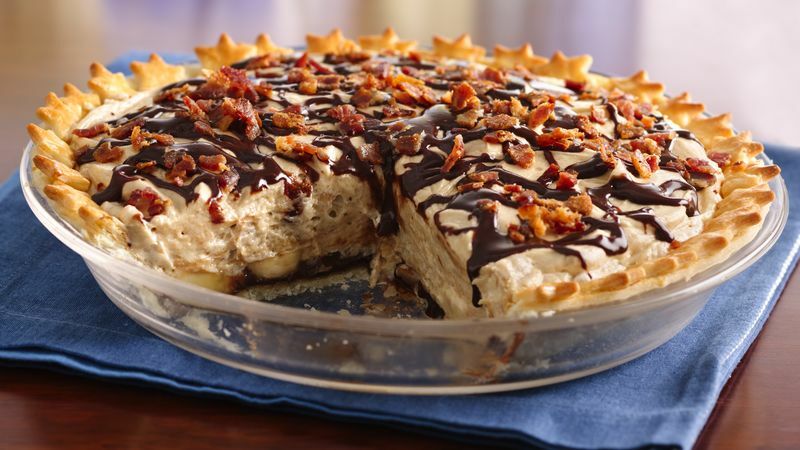 Spread cream cheese-peanut butter filling over bacon pieces. Drizzle 2 tablespoons chocolate sauce over filling. Sprinkle remaining bacon pieces over top of pie. Refrigerate until ready to serve. Cover and refrigerate any remaining pie. Make cleanup even easier! Before baking the bacon, line the baking sheet with foil, turning the edges up slightly to make sure the grease stays in the pan. Use the leftover chocolate sauce as an ice cream topping.